How to register cash or check payments? Learn how to register your client's cash or check payment. Do you have a client who has just paid you a cash or check payment? Use the "Add Payment" function to record it and ensure that your client's remaining balance is correct. 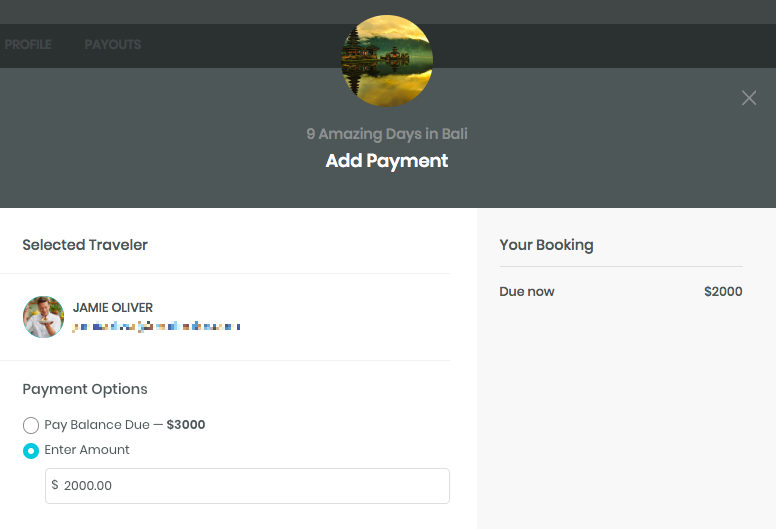 To add a new payment to your client's booking please go to your trip dashboard and choose "Add Payment"
Pay Installment Due -- this allows you to pay the next installment for your client. Pay all remaining installments -- this allows you to pay the all of the remaining installments for your client. Client's balance will be fully paid. Enter Amount -- this allows you to record a custom amount being paid at your discretion. Client's balance due will be reduced by the amount entered. 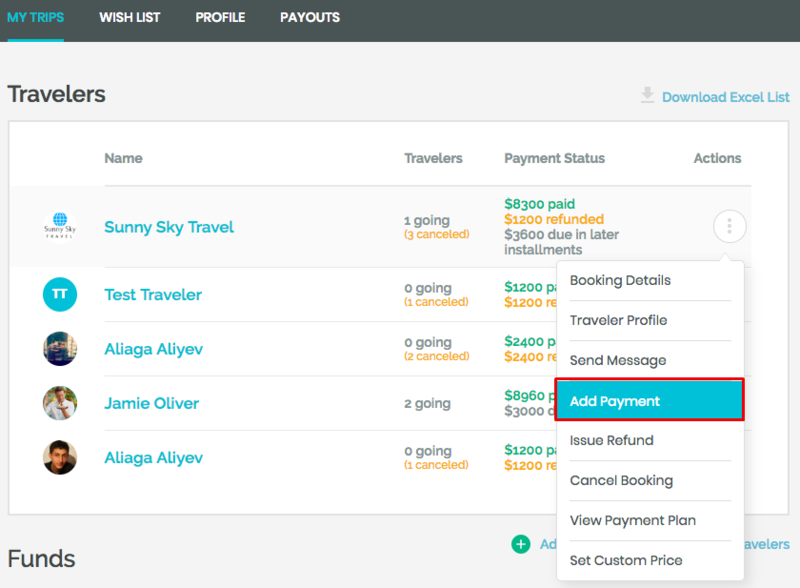 Pay Balance Due -- this allows you to pay the balance due of the trip for your client. You can now choose the payment method. There are 3 options, please use the "Cash or Check" option. You can record cash or check payments, no transaction fee applied. You can choose if you'd like your client receiving a booking confirmation email by checking the box. We highly recommend to use the note field to indicate details about the payment so you and your client will know what this payment refers to. Checking Account (ACH for USD, SEPA for EUR and BACS for GBP). You will have to have your client's bank information at hand, standard WeTravel pricing applies. Your client receives a booking confirmation email. Credit/Debit Card. You will have to have your client's credit/debit card information at hand, standard WeTravel pricing applies. Your client receives a booking confirmation email. Click on "Confirm Payment" and you have successfully recorded a payment. You will see the following message: "Payment successfully added". You can now manage that participant's booking as usual! What are the fees using Add Payment function? 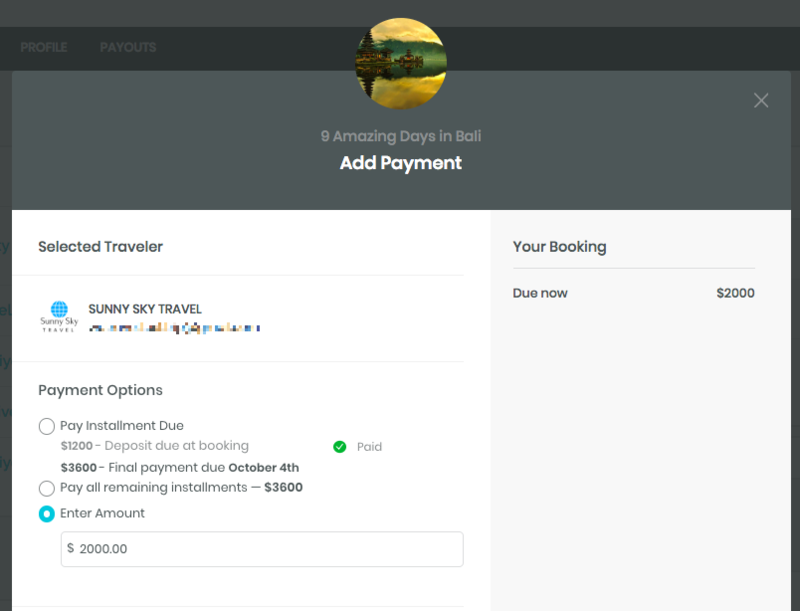 Regular WeTravel pricing applies unless you're recording a cash/check payment, for which we don't charge any fees. How is the payment plan affected if I record a custom amount? The payment plan will have the same dates as before. The balance due will be reduced by the amount you've just entered. The payment will first be applied to the deposit. If it's larger than the deposit, it will be applied to the deposit and the first installment. If it's even larger, it will be applied to deposit, first installment and second installment, and so forth. Is the payment information saved? No, for security purposes we don't save your client's payment information. Can I add payment when the booking has been canceled? No, payments can only be added to users who are marked as going. If you have canceled a user and want to reinstate them, please ask them to book the trip again. Are my Terms and Conditions that I have added on my profile included in this function as well? Yes, they are. 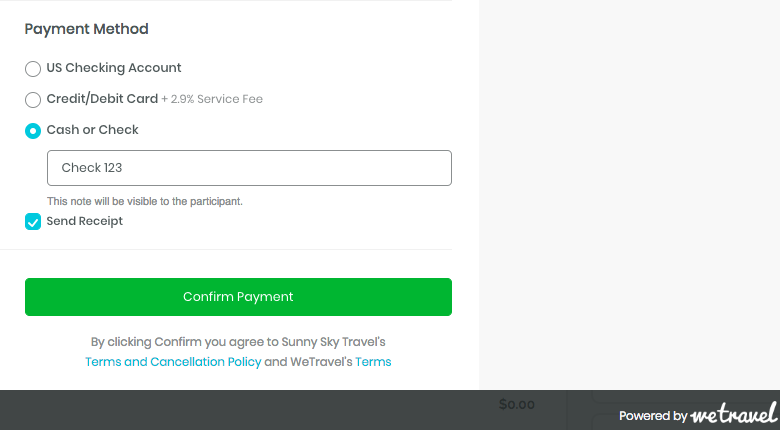 WeTravel Business users have the chance to add their own Terms and Conditions to the checkout process and they are agreed to when you click on "Confirm Payment". Can I change the note after confirming the payment? No, unfortunately the note cannot be changed after confirming the payment.